Raven 1.2m, 1.8m & 2.4m satellite dishes. Fixed AZEL satellite dish. Andrews 1.2m, 1.8m & 2.4m satellite dishes. Channel Master 1.2m, 1.8m & 2.4m satellite dishes. Raven 1.2m, 1.8m and 2.4m fixed dishes with azel mount. Raven 1.2m fixed dish with AZEL mount CM12AZELI. Raven dishes - formerly "Andrews" and before that "Channel Master". Manufactured by Skyware Global.Included is the Titanium third edition 0.1dB LNBs that are widely praised on many web sites.The third edition has the gold connections and is very low noise. An ultimate performance LNB.The Raven 1.2m dish is probably the best dish 1.2m offset dish in the world.The Raven fixed AZEL mount fits on a 75mm pole. An optional Raven feedhorn and c120 flange LNB with 23mm to 40mm spacers is available. The Raven feedhorn works best with the 1.2m, 1.8m and 2.4m Raven dishes and is highly recommended for use with these dishes. Use this feedhorn with a C120 flange LNB for better matching and a higher gain than a 40mm clamp LNB of equivalent noise level. Why buy a high quality Raven dish and use a compromise 40mm mass market LNBF where the feed is made for ANY dish?Taking a 1.2m dish as an example - A 40mm LNB may only illuminate 1.1m of dish area or perhaps 1.3mof dish area (i.e. including noise round the edges) but with a matched feedhorn, exactly 1.2m of disharea is illuminated. This feedhorn is for offset dishes and can also be used on other makes of offsetdish. It comes with adapters for either 23mm or 40mm clamps and it comes with the ultimate 0.2 dBInverto LNB. The best combination money can buy. Inverto LNBs are high output LNBs and work well even with long cable runs. Twin, quad and quatro C120 LNBs are also optional. The one piece reflector is thermoset-molded glass fiber reinforced polyester for strengthand rigidity and surface accuracy. An ultimate dish system for enthusiasts. An ideal wall mount is the Primesat WMS55076 and the ideal ground stand is the Primesat GS761FW. Gain 42.0 dBi at 11.95Ghz. 3dB beamwidth - 1.6 degrees. Collar fits a 76mm (3.0 inches) pole. 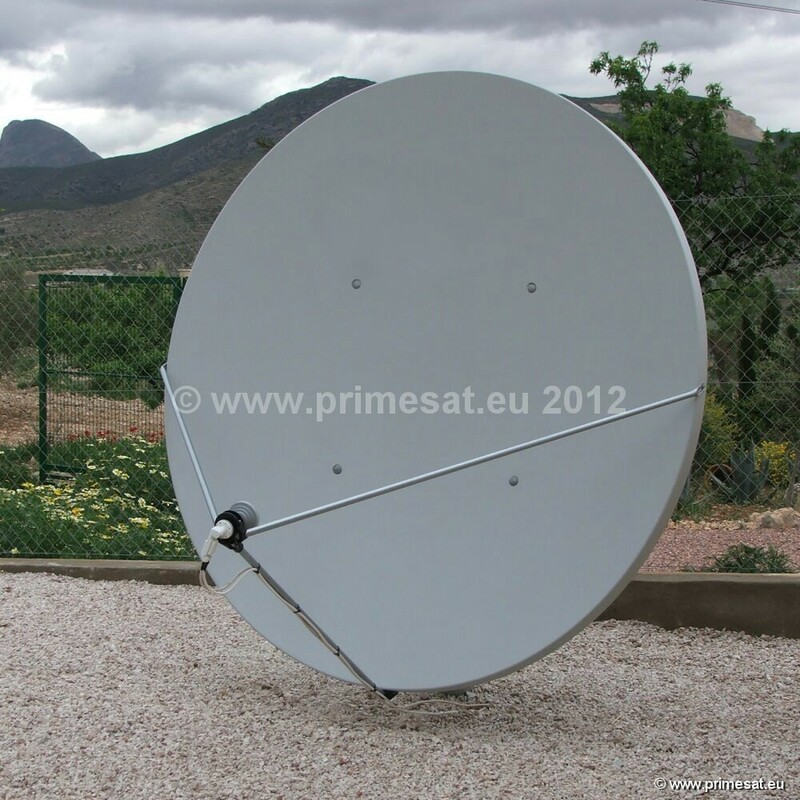 The Raven / Primesat 1.2m motorised dish CM12PR18I is also available. See the Raven 1.2m motorised dish page. Update - An inclined orbit motorised dish is also available. Heavy duty Raven 1.8m fixed dish kit including Raven AZEL mount, Titanium 0.1dB LNB with twin, quad and quatro LNb options. This is a Raven (formerly Andrews and before that Channel Master) 1.8m dish. A very high gain one piece proven design. The Raven fixed AZEL mount fits on a 115mm pole. Included is the Titanium third edition 0.1dB LNBs that are widely praised on many web sites.The third edition has the gold connections and is very low noise. An ultimate performance LNB. The Raven feedhorn works best with the 1.2m, 1.8m and 2.4m Raven dishes and is highly recommended for use with these dishes. Use this feedhorn with a C120 flange LNB for better matching and a higher gain than a 40mm clamp LNB of equivalent noise level. Why buy a high quality Raven dish and use a compromise 40mm mass market LNBF where the feed is made for ANY dish?Taking a 1.8m dish as an example - A 40mm LNB may only illuminate 1.7m of dish area or perhaps 1.9mof dish area (i.e. including noise round the edges) but with a matched feedhorn, exactly 2.4m of disharea is illuminated. This feedhorn is for offset dishes and can also be used on other makes of offsetdish. It comes with adapters for either 23mm or 40mm clamps and it comes with the ultimate 0.2 dBInverto LNB. The best combination money can buy. Inverto LNBs are high output LNBs and work well even with long cable runs. Twin, quad and quatro C120 LNBs are optional. The one piece reflector is thermoset-molded glass fiber reinforced polyester for strength and rigidity and surface accuracy. An ultimate dish system for enthusiasts. 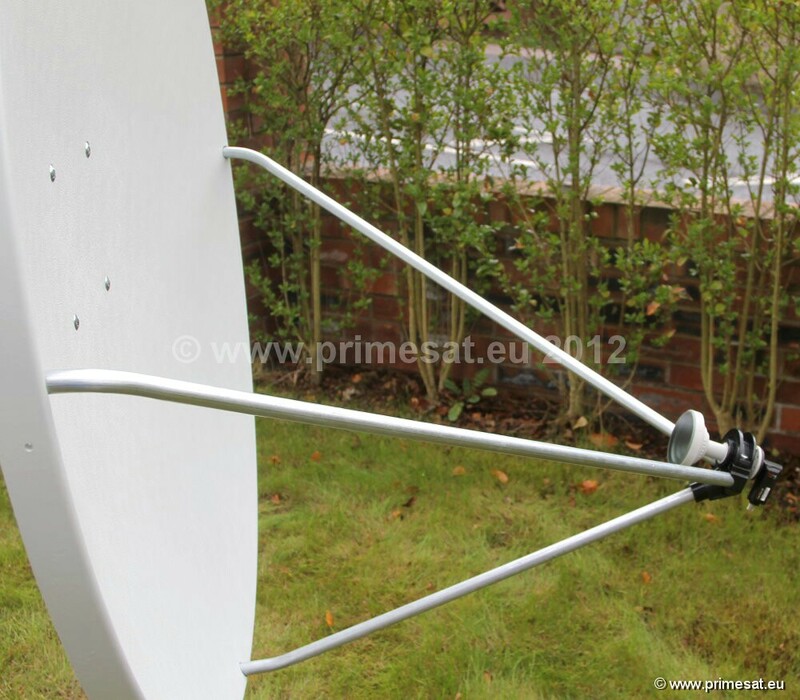 The Primesat GS45125 ground stand is recommended for the fixed version of this dish. Gain 45.5 dBi at 11.95Ghz. 3dB beamwidth - 1 degree. Collar fits a 115mm (4.5 inches) pole. 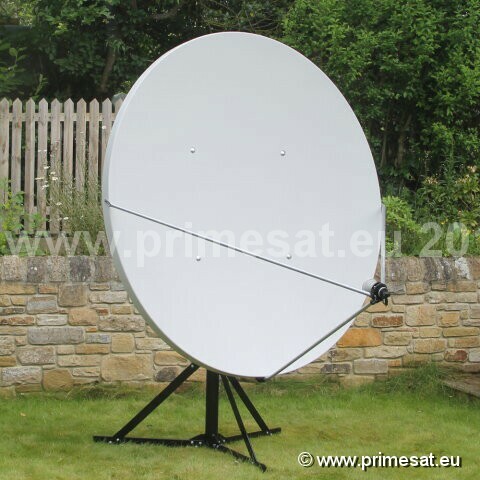 The Raven / Primesat 1.8m motorised dish CM18PR24I is also available. 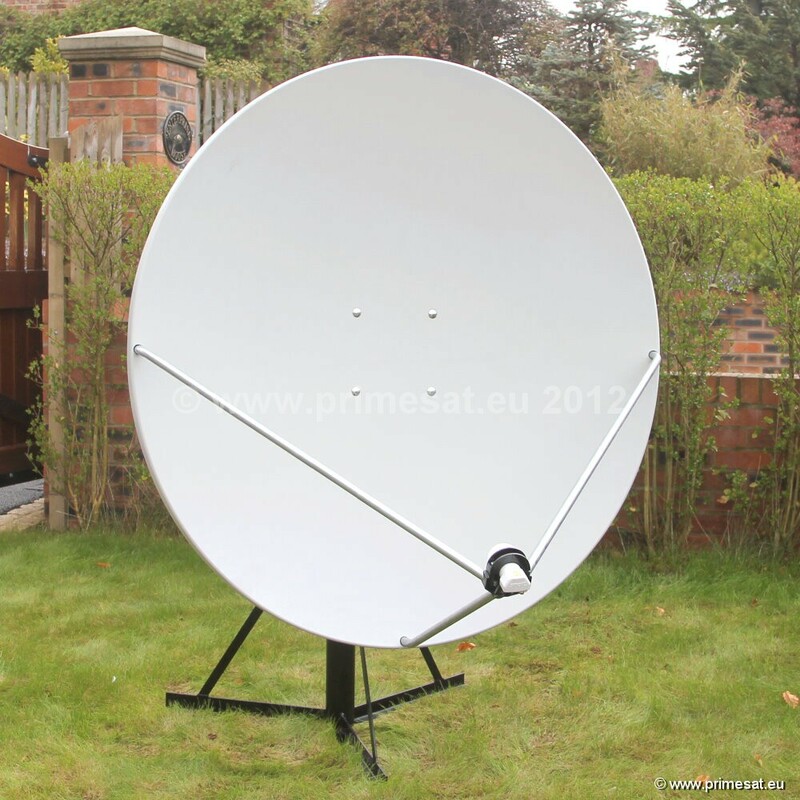 See the Raven 1.8m motorised dish page. Raven fixed 2.4m dish kit with Raven AZEL mount. CM24AZELI. 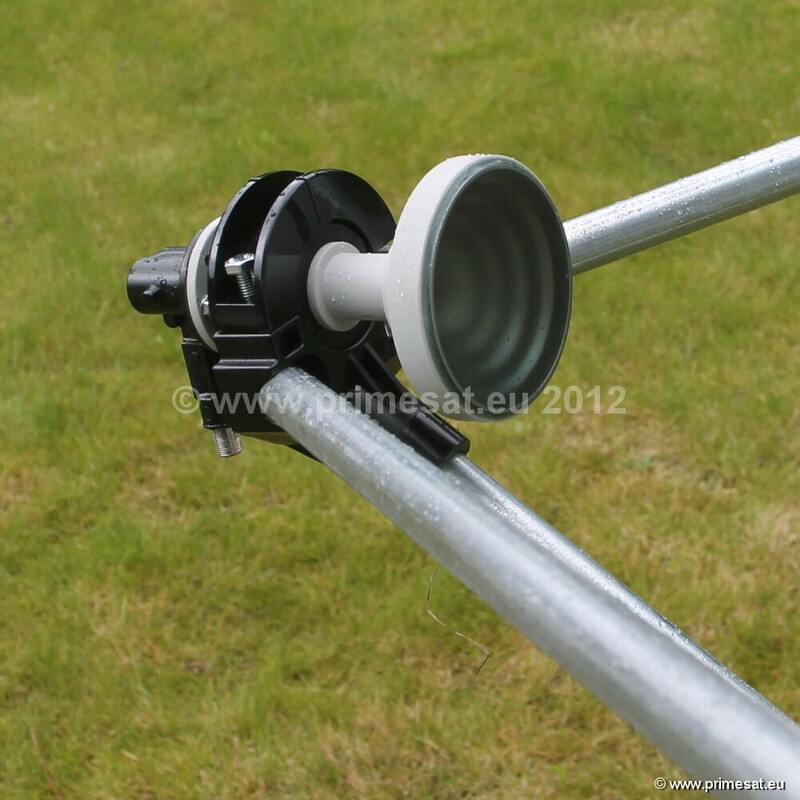 Heavy duty Raven 2.4m fixed dish kit including Raven AZEL mount, and Raven matched feedhorn with C120 0.2dB Inverto LNB. This is a Raven (formerly Andrews and before that Channel Master) 2.4m dish. A very high gain one piece proven design. The 2.4m Raven dish is probably the best 2.4m offset dish in the world.The Raven AZEL fixed mount fits on a 165mm pole. A Raven feedhorn and c120 flange LNB with 23mm to 40mm spacers is included. The Raven feedhorn works best with the 1.2m, 1.8m and 2.4m Raven dishes and is highly recommended for use with these dishes. Use this feedhorn with a C120 flange LNB for better matching and a higher gain than a 40mm clamp LNB of equivalent noise level. Why buy a high quality Raven dish and use a compromise 40mm mass market LNBF where the feed is made for ANY dish?Taking a 2.4m dish as an example - A 40mm LNB may only illuminate 2.3m of dish area or perhaps 2.5mof dish area (i.e. including noise round the edges) but with a matched feedhorn, exactly 2.4m of disharea is illuminated. This feedhorn is for offset dishes and can also be used on other makes of offsetdish. It comes with adapters for either 23mm or 40mm clamps and it comes with the ultimate 0.2 dBInverto LNB. The best combination money can buy. Inverto LNBs are high output LNBs and work well even with long cable runs. Twin, quad and quatro C120 LNBs are also optional. 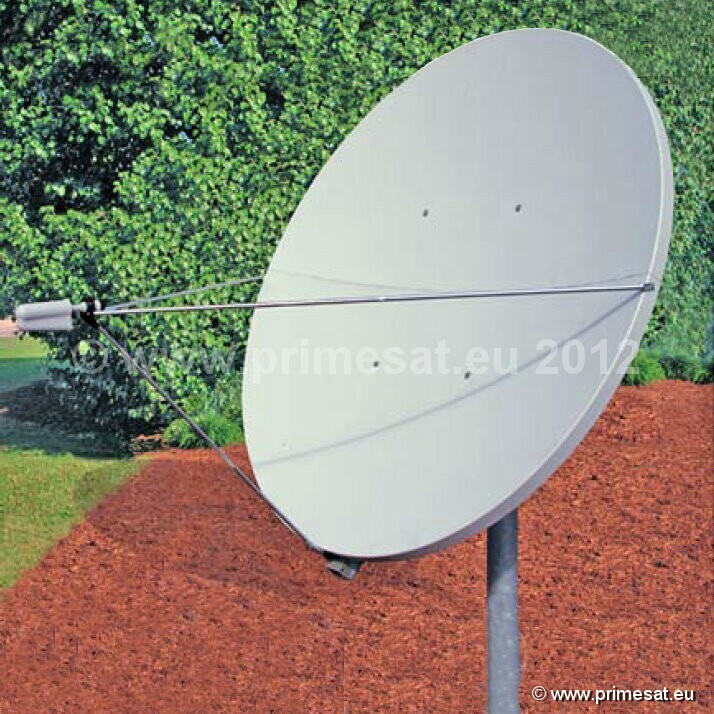 The Primesat GS65160 ground stand is recommended for the fixed version of this dish. Gain 47.6 dBi at 11.95Ghz. 3dB beamwidth - 0.7 degree. Collar fits a 165mm (6.5 inches) pole. 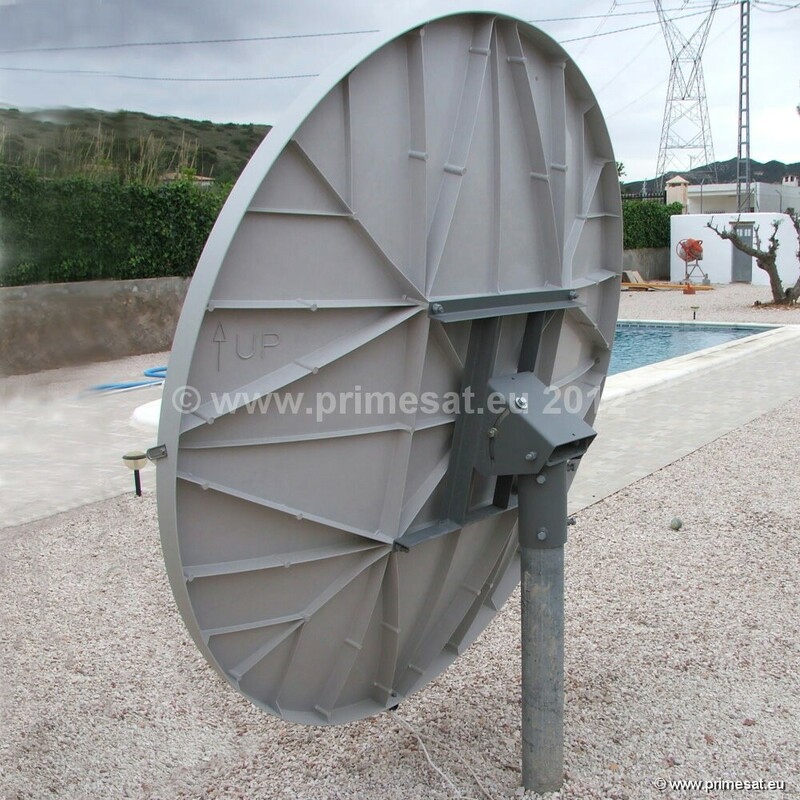 The Raven / Primesat 2.4m motorised dish CM24PR36I is also available. 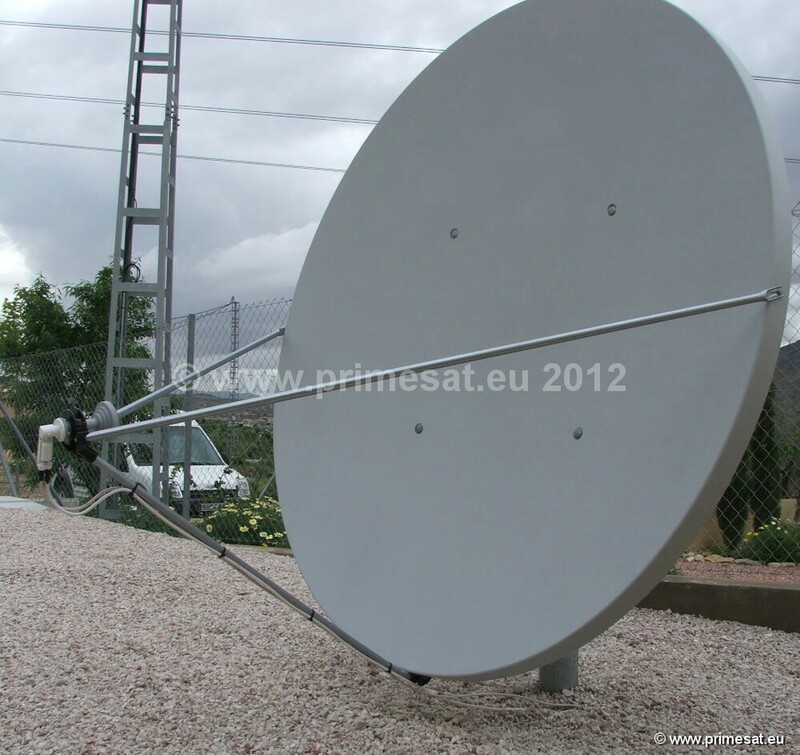 See the Raven 2.4m motorised dish page.